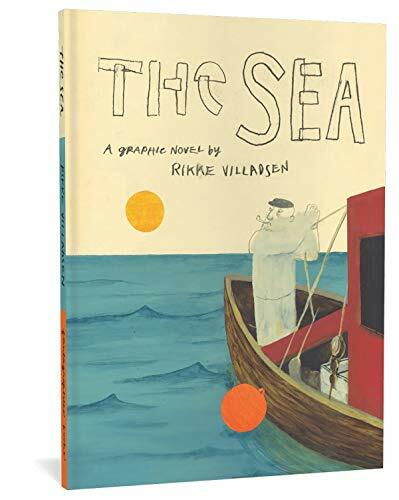 We associate surrealism with paintings from the 1930s and '40s, but Rikke Villadsen, a Danish cartoonist, offers a graphic novel version of surrealism in her book, The Sea. The main character is a fisherman, “just a fisherman,” who catches a fish and a baby, by design or accident, isn't made clear. The fisherman is clearly “lost at sea,” swept up in the fog around him both literally and figuratively—the pencil art looks erased by the fog (a nifty technique). The fisherman comes across as cranky and miserable; the fish and the baby are the wise ones in the story. Wiser still is the woman at the end who emerges as the baby's mother (still pregnant and waiting for its birth). If the plot sounds hard to follow, that's because there's no real linear sequence. We follow the fisherman's clear unhappiness to his ultimate end, swallowed by the waters where he's lived his life. But we are no wiser as to his relationship to the woman, the baby, the fish, or to himself, in fact. Or to his work as a fisherman, despite the introduction that his tattoos spell out. Still, the authority of the artwork makes this book a quick, mesmerizing read. It feels more like a dream than a book, the definition of surrealism. Marissa Moss is author and illustrator of numerous children's and young adult books, both fiction and nonfiction. Her most recent titles are Kate Warne, Pinkerton Detective and Last Things: A Graphic Memoir of Loss and Love.